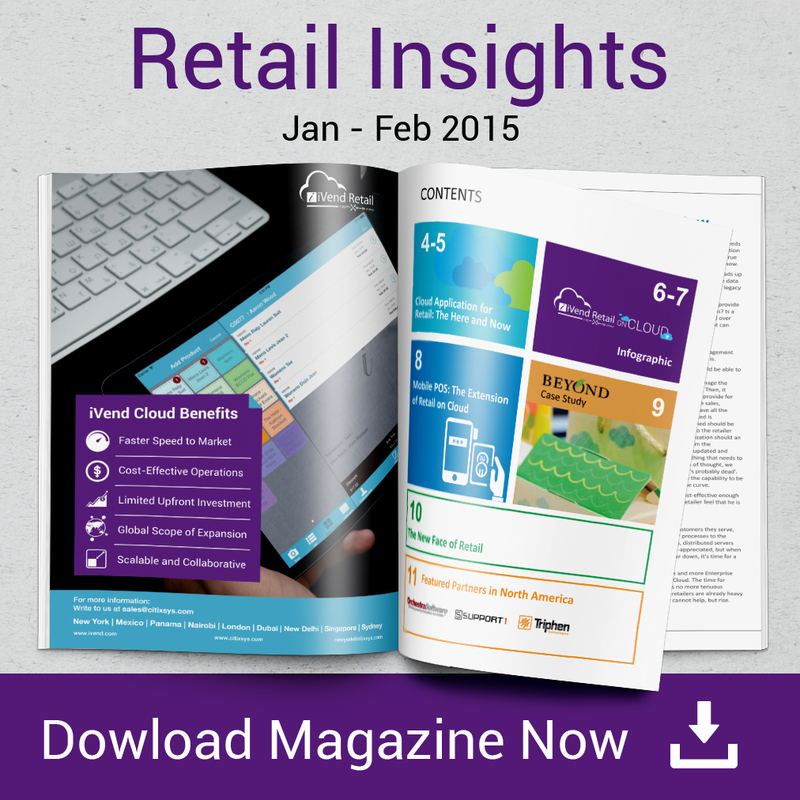 In this year’s first issue of CitiXsys Retail Insights 2015, we’ve taken up why the Cloud is the way to go for retailers. Especially for large-scale enterprise retailers, cloud-based applications may as well be the only solution which would enable them to be as flexible, adaptable and infrastructure-minimalist as they aspire to be. The cover story outlines why and how cloud applications can help retailers to cut down IT infrastructure flab. Also, it talks about the advantages of integration of every operation and process of an enterprise retail into a single, consolidated suite. 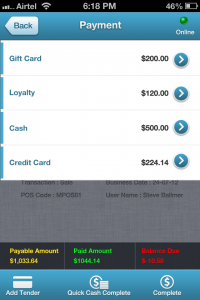 And finally, the main value of Cloud in Retail: Mobile POS. 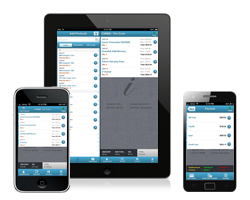 Taking the Mobile POS angle further, another article speaks further on how smartphones, tablets and iPads equipped Cloud-connected retail applications can empower store assistants and traditional POS to a whole new level of performance. We also take a look at how a retail store might function when it is powered by a Cloud-based Retail Suite and Mobile POS. it would turn normal retail operations on its head, increasing efficiency and decreasing investment by several factors. This issue takes a whole new look at how retail operations would change, when integrated with new technology, especially Cloud Applications. The CitiXsys Team wishes our readers a fruitful and fulfilling year ahead. Success of an eCommerce platform largely depends on its aesthetics, ease of use and most importantly the content management module. Content is closely tied to all of the processes such as display, order management, inventory, promotions etc. and so content management plays a fundamental role in Internet-based commerce. The ability to easily update, add to and manage an eCommerce online store is a necessity for a successful and profitable website. Content management system in iVend eCommerce allows users to not only manage products and orders, but customers, promotions, newsletters and much more. An integrated content management system puts a retailer in direct control of his eCommerce content. Intuitive functionality and modules in iVend eCommerce empowers Retailers’ without extensive programming experience to easily update and modify their portal without unintentionally affecting the overall design of a site. The portal comes with a mobile responsive skin and with the right customization from designers and developers, a user can maintain his webstore without ever writing a line of code. 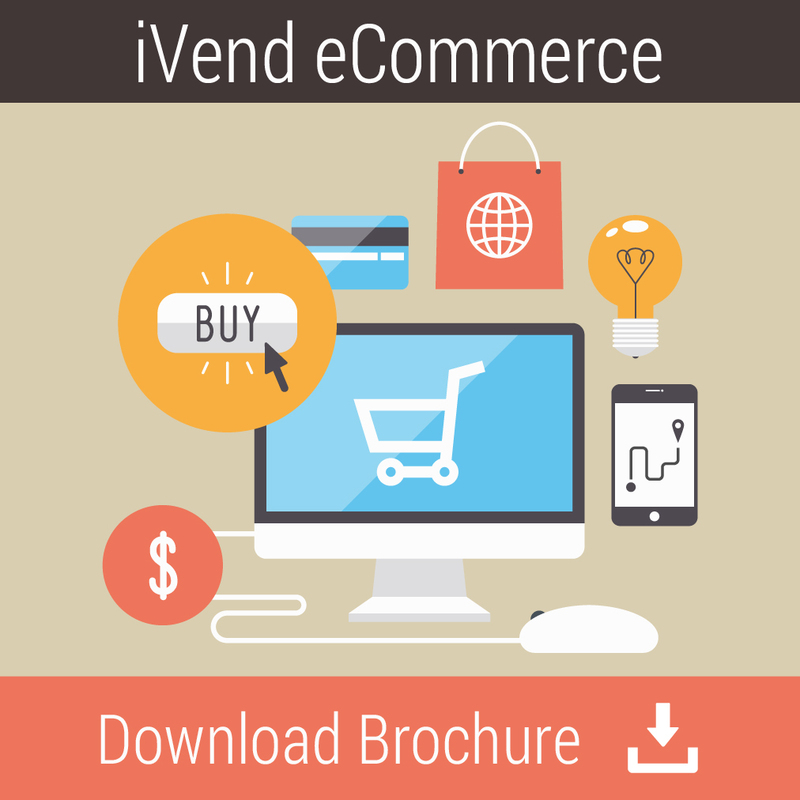 iVend eCommerce allows administrators to make changes in real time, as a result, retailers have robust B2B or B2C capabilities, with personalization, and content-driven site much more quickly. iVend eCommerce has a content manager that includes the functionality for scheduling content and multi-level administrative privileges for different users, allowing retailer to customize the system based product release calendar and staff roles. User-friendly formatting, with clear fields for Meta summaries and titles in iVend eCommerce, makes it easier to optimize content for search engines. With options for multilingual sites available, content manager in iVend eCommerce aids in reaching an international audience. iVend eCommerce has a Responsive design making it simple to create sites that users can view on any device irrespective of the screen size they view it on. Content manager in iVend eCommerce systems increases your ability to reach your full customer base with integrated Shipping and Payments. The function of the merchandise hierarchy is to categorize products and is NOT intended to describe product or classify organizational, production or design elements. Merchandise hierarchy can have multiple levels with the highest level providing an overall enterprise view and then narrowing down to families or classes of products, with the total number of levels being determined based on specific business requirements and is the same throughout the enterprise. It provides a common language and consistent codes at each hierarchical level and ensures that merchandise systemically resides in one place and is grouped based on similar form and format and common purpose and use. Hierarchical classification of products allows companies to customize their data analysis and evaluation, and to address specific needs of individual businesses or the overall enterprise. 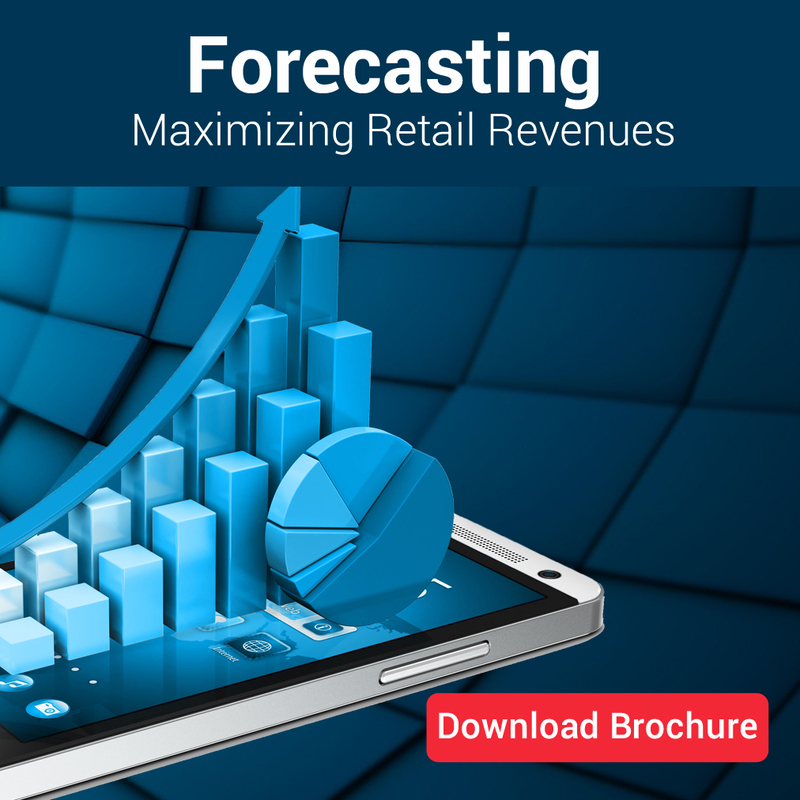 A retail organization with well – structured merchandise classification has a fuller view of its products across multiple levels and is able to drill down and analyze data in a variety of ways suitable to their specific business requirements. A standardized merchandise classification allows similar items across different businesses to be grouped logically. This allows a retailer to view, evaluate and report on data at different aggregate levels and with higher accuracy not only within an individual business, but also across multiple business lines at an overall enterprise level. By incorporating merchandize hierarchy a retailer benefits through better performance visibility, understanding of consumer demand, and more effective merchandise and sales planning. The benefits continue down the supply chain and are reflected in better integration with supply chain partners, and improved coordination between retail planning and production, which in turn leads to a reduction in production costs and inventory requirements. Standardization of the merchandize structure and allocating data ensures data integrity, allowing data governance to be addressed throughout the retail chain at an enterprise level. Not limited to this, it supports continuous business growth and accommodates moving into other product lines and other industries as the business expands. Through development of common definitions, terminology, nomenclature and structures, an enterprise-wide standardization approach to merchandise classification becomes a key element in driving successful planning, analytical and execution capabilities at a retailer. iVend Retail Summit, 2013 was a resounding success. The partner event which spanned for 3 days had a good mix of sessions covering growth drivers by Kamal Karmakar, CEO CitiXsys Group of Companies and interesting sessions on the new innovations, product trainings, product roadmap for iVend Retail Management Suite and informative sessions on Marketing and Joint Marketing with partners. iVend Retail Management Suite from CitiXsys has matured from an application to a Retail Platform where the constituent complementary applications of the suite are now available in their individual capacities to be integrated into standard ERP and Accounting applications. 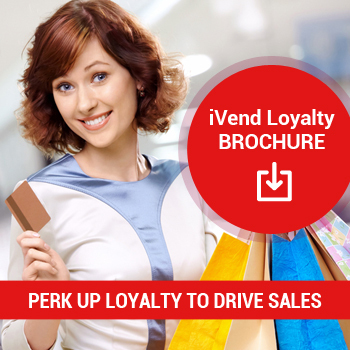 The recent innovations make iVend Retail Management Suite firmly substantiate the organization’s goal of bringing technology innovations to make profitable retailers and happy customers. This was emphatically reflected when CitiXsys announced iVend Passes and iVend Mobile. 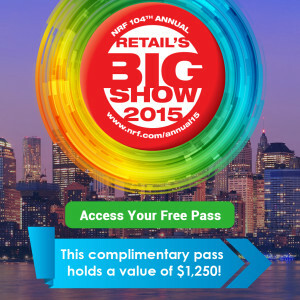 iVend Passes is a platform for retailers to deploy Digital Passes on Apple Passbook and Android devices helping retailers stay connected with their customers and enhancing customer experience. 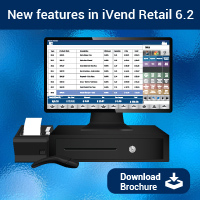 iVend Mobile is a POS on an iOS device or an Android tablet, equally suited for small format retail chains and large format retailers and is used for faster expansion or as a queue buster. The cornerstone of the sessions was the announcement of CitiXsys Knowledge Portal, which will serve as the central repository of knowledge for all partners, customers and CitiXsys employees to collaborate better. The CitiXsys Knowledge Portal, which immediately got the name CKP was very well appreciated by the partners as the portal aims to provide a single window to address all queries of partners through its comprehensive forums section, knowledge base repository, wikis, marketing collateral, etc. Breakout sessions on Sales and Consulting were held in parallel. All the sessions whether related to sales or consulting & implementation were extremely interactive and helped partners not only understand the applications and their positioning better, but also gave them an opportunity to clarify their queries related to consulting. The consulting & implementation track covered detailed sessions on implementation methodology, product trainings and how can partners effectively utilize the CitiXsys Support Infrastructure to better serve their customers. The partners also got to understand how CitiXsys can help them better market iVend Retail Management Suite in their respective markets by leveraging the Joint Marketing initiatives of the Marketing Division at CitiXsys. The session concluded on a “high”, with a commitment to host a similar session early coming year. Mobility is indeed a buzzword these days and the biggest beneficiary of this boom is the retail industry. Powerful, feature rich Smartphones & tablet devices in the hands of the consumers coupled with much improved Internet technologies are forcing the retailers to adopt mobility in their business environment. Retailers are today extending brand & product information, ordering capabilities and payment options on mobile platforms to consumers. These mobile platforms are either smartphones or tablet-based devices, which are either consumer owned or employee operated. 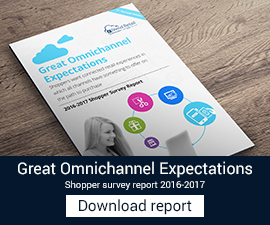 A recent report shows that over 45% retailers are most likely to adopt mobile platforms to cater to rapidly changing customer expectations. Given the nature of these devices, it is far more likely for an electronics retailer to adopt a mobile platform to increase customer satisfaction and use this as a shopping differentiator. A consumer would use a mobile device for placing an order, looking for ratings, reviews, redeeming coupons, use passport services to store all loyalty points, coupons, gift certificates, etc. A retailer would use a mobile platform to enhance in-store shopping experience by using mobile devices as line / queue busters, marketing functions like dynamic location based messaging for promotions, advertising, etc. The possibilities are endless and so are the technological options available to both – the retailer and the end consumer. It is no longer futuristic for a consumer to walk into a store, select an item, order it online using his mobile phone with an option to collect the item form the same store right there. By using the mobile platform, the consumer will be able to get a better deal online, redeem his loyalty points and gift cards and still walk out of the store with the item, as if it were tendered out at the till in the store. All these points prompted iShops in Egypt to select iVend Retail – a Complete & Integrated Retail Management System in their stores selling amongst other, Apple products. Retailers in the Electronics Vertical are faced with a unique set of challenges. Hundreds of products in tens of categories, ever changing models and their series including sizes, different types of accessories and all serial controlled make inventory management a herculean task for the retailers to keep pace with the changes and evolution. Not only this, electronic products are extensively compared for their features and underlying technology before a consumer decides on a particular brand and model. Recording these features with an ability to compare models across a price range is a fundamental expectation from a Retail Solution. Electronic items are not limited to the ones, which are portable and can be carried away by the customer. These items also include big sized items, which require installation and configurations with custom shipping needs. iVend Retail Management Suite with its integrated applications allows an electronic retailer to effectively manage these challenges across multiple sales channels – in-store or online. Actually, more so, on the online eCommerce offering that a retailer may have.